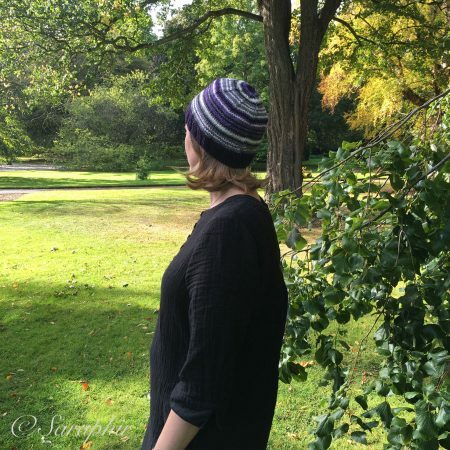 Adult Bentie Beanie - a free knitting pattern for a simple beanie. This Adult Bentie Beanie is the adult version of the Bentie Beanie for children and toddlers that I published back in November. 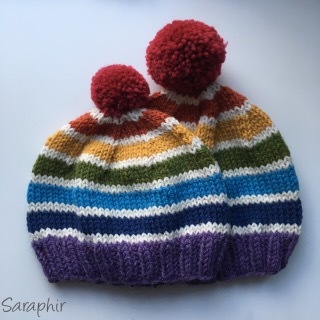 The beanie pattern is very versatile and doubles very nicely as a pompom hat for both adults and children. 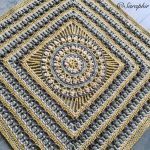 It’s a simple pattern which can be made in any number of stripe variations and topped with a pompom if so wished. 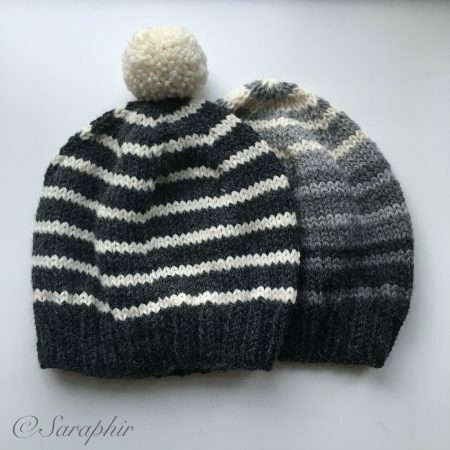 The hats are made with Drops Nepal, which is an Aran weight yarn in a 35% alpaca and 65% wool mix which is very soft and lovely to work with. I am very sensitive to itchy wool hats, but I can wear hats made with this yarn. 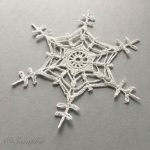 I use 5 mm needles and the gauge/tension is the pretty much exactly the same as the one given by Drops: 10 x 10 cm is 17 stitches and 22/23 rows. I start all my hats on circular needles (20 cm long) and when it starts to get too tight due to the decreases I transfer the stitches to wooden double pointed needles (I work with 5). I prefer working with wooden ones as the stitches slip off the metal ones very easily and I found my hands were getting more tense from the effort of preventing this. 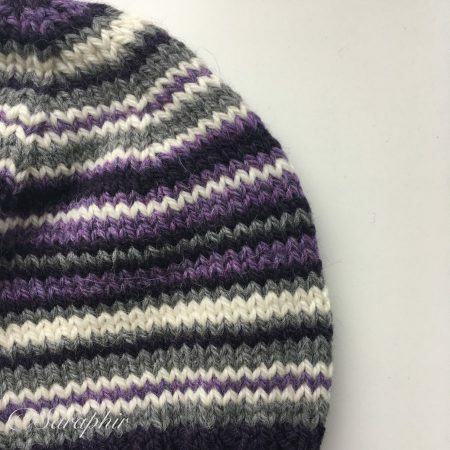 You can make the hats on straight (two normal) needles as well and sew the sides together at the end, but the end result is not as neat. 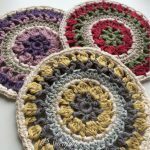 If you have never worked on circular needles I would really recommend giving it a try – it is much faster and neater once you get the hang of it. The pattern is given below. 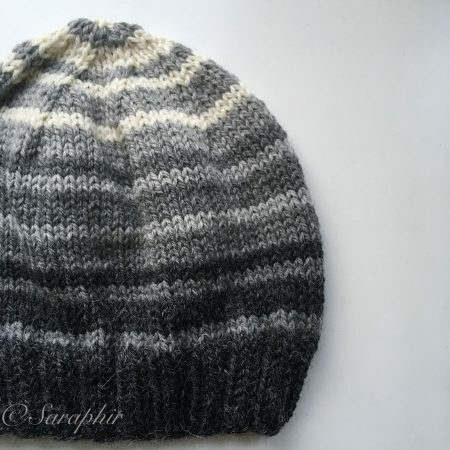 Apart from the rib section the hat is only worked in stocking/stockinette stitch and the pattern is written out as if you are using circular needles. 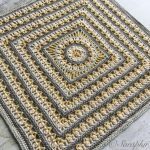 If you are working on straight needles you will need to purl every second row, which should be the row between the decreases. 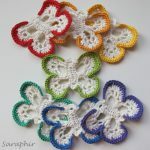 The Round numbers are given as if you are making a hat for a woman or a small male head where you would do 24 rows of stocking stitch – if you are making a hat for an average size male head (26 rows stocking stitch) you would need to add 2 to each row count. Cut the yarn leaving at least 20 cm. 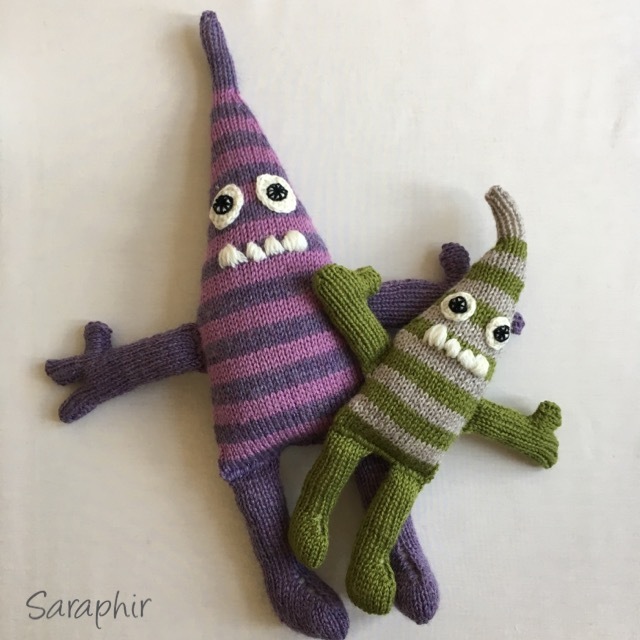 Thread it on to a darning needle and pull the yarn through the remaining stitches while they are still on the knitting needle, take out the needles and pull tight. Circle through again and pull tight. Bring the yarn to the backside of the hat and sew in the end. Sew in all other ends. Make pompom if needed and attach securely to the top of the hat: sew ends through the last 8 stitches and pull tight. You can sew through the stitches again to make it really tight and sew in the ends. I hope you enjoy making – and wearing – this beanie. 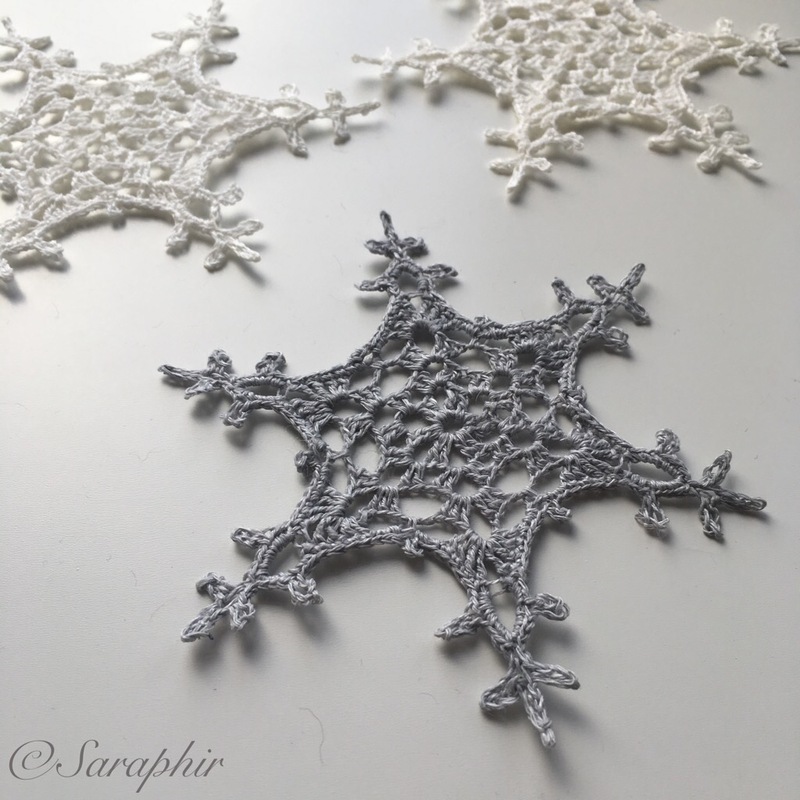 I would love to see your versions of it, so if you feel like sharing you can tag me on Instagram @saraphir, share a photo on my Facebook Page or create a Ravelry Project.